Paradiso and Rasamayi Return to LSY! Join us for another wonderful, centering concert from Paradiso and Rasamayi on Sunday, September 18th at 6PM. Of course, the world’s largest crystal dijeridoo will return as well. 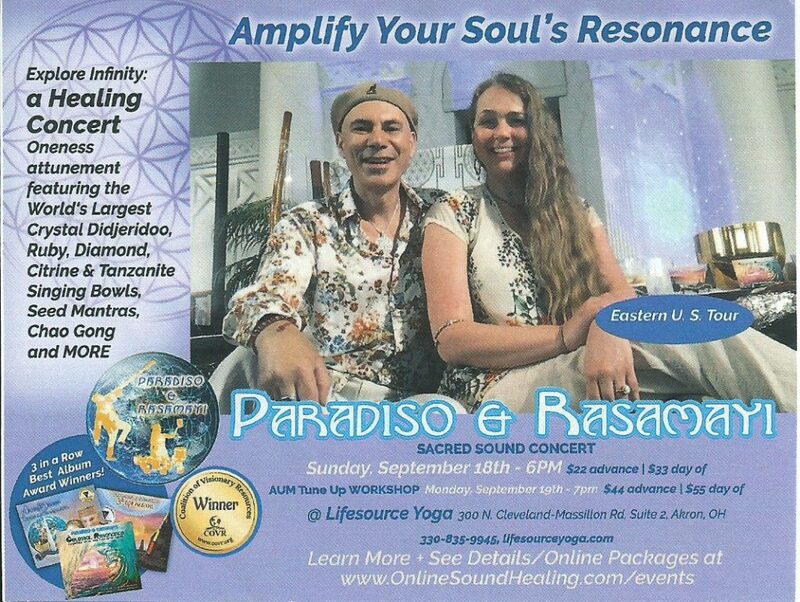 Paradiso and Rasamayi will also lead an AUM Tune up workshop on Monday, September 19th at 7 PM. Both events offer discounts for reserving your spot early, so be sure to act fast! To buy tickets: go to the “Schedule” option from the “Classes” tab (or copy and paste this link: http://lifesourceyoga.com/our-classes/schedule/) and scroll using the “Next” button until you reach September 18th for the concert or September 19th for the workshop. Then click “Enroll,” and follow the on-screen instructions. You’ll be all set for a night of sound healing!